To be recognized as a catalyst for empowering learners to be global citizens who positively change the world. modeling sound research-based teaching methods. engaging community partners in collaboration to inspire positive change. developing literacy in content, technology, and communication. nurturing and developing responsible, innovative, reflective, and caring educational professionals. providing diverse experiences for learners. The Empowered Practitioner models sound research-based teaching methods and assessments to facilitate learning. The Empowered Practitioner applies content knowledge, research, and theoretical concepts to enhance learning. 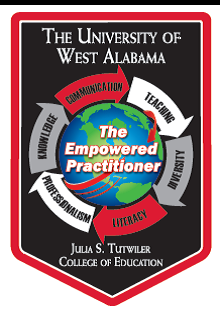 The Empowered Practitioner utilizes differentiated experiences to engage diverse learners. The Empowered Practitioner enhances teaching and learning through effective technology integration. The Empowered Practitioner uses effective communication skills and demonstrates literacy across the curriculum. The Empowered Practitioner demonstrates appropriate professional practices.